With the fates of most of their existing shows already decided, FOX has announced four new dramas and five new sitcoms for the 2013-14 season. One of the comedies is called Enlisted. It stars Geoff Stults and was created by Cougar Town’s Kevin Biegel. Other new FOX shows are Almost Human, Brooklyn Nine-Nine, Dads, Gang Related, Rake, Sleepy Hollow, Surviving Jack,and Us & Them. What do you think? Based on this limited information, will you give Enlisted a look? More about: Enlisted, Enlisted: canceled or renewed?, FOX TV shows: canceled or renewed? I will look forward to seeing something new and funny! I will recommend it to my friends! 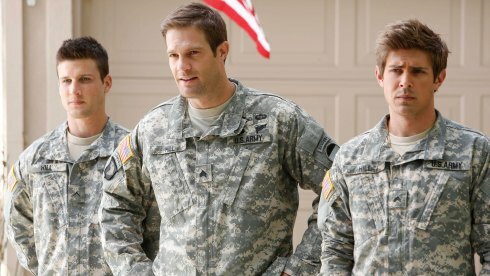 I can’t watch that show if that’s the haircuts the “enlisted” will have.